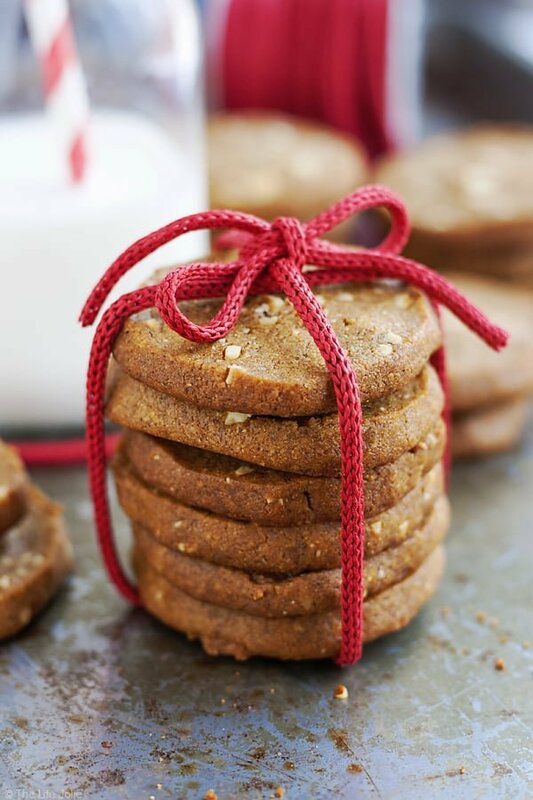 These Almond Ginger Cookies are such an easy dessert to make! This crispy cookie is the best slice-and-bake option if you’re looking for a spicy cookie that is that isn’t overly sweet. They’re great for Christmas! I’ll usually take at least one new cookie recipe for a test drive each year. This one is from my beloved Betty Crocker’s Cooky Book. I found it at our church rummage sale and jumped to get it. My mom has this too and it’s practically falling apart from the amount of use it’s seen over the years! I kept coming back to the recipe for ginger cookies so I knew I had to give them a go. The result was a spicy, crispy slice-and-bake cookie that has a great chew to it once you’ve gotten through that crunchy first bite. It’s an excellent option for dunking into a nice hot cup of coffee or a glass of milk. If you’re in the mood a cookie that is less up-front in blatant sweetness with a satisfying crunch and chew to it as well as a spicy kick, this cookie is your guy. It’s a bit more sophisticated than your usual sugar cookie. The original recipe calls for shortening but I opted for butter because I like the flavor it adds. It also makes the cookies a it crispier. The original recipe calls for light molasses but we only have dark molasses available. They still came out great! I wrap the logs in wax or parchment paper for rolling to make it easier. Can I freeze these? Definitely! You have two options- to freeze them once they’re in log form to later thaw and bake or to freeze them once bakes. Both work out super well! Are these cookies kid-friendly? My kids were definitely fans. 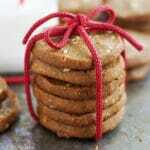 How long do ginger cookies last? Around a week in an airtight container. 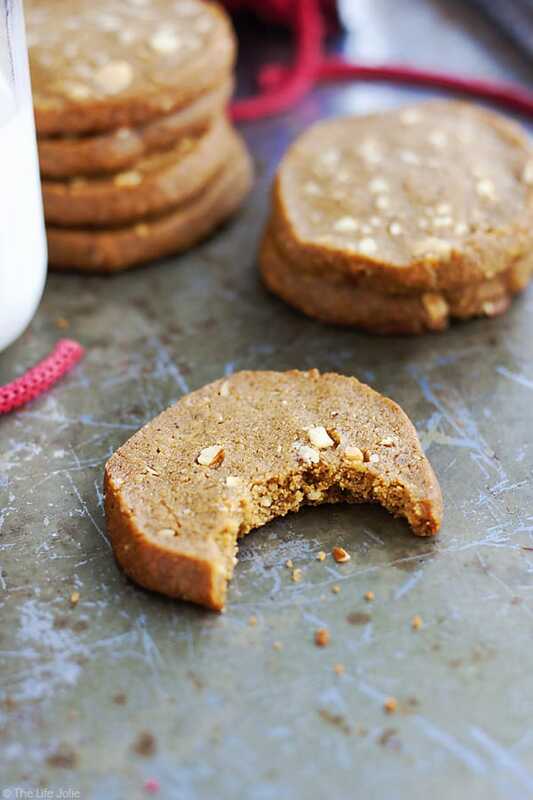 Are gingersnaps and molasses cookies the same? 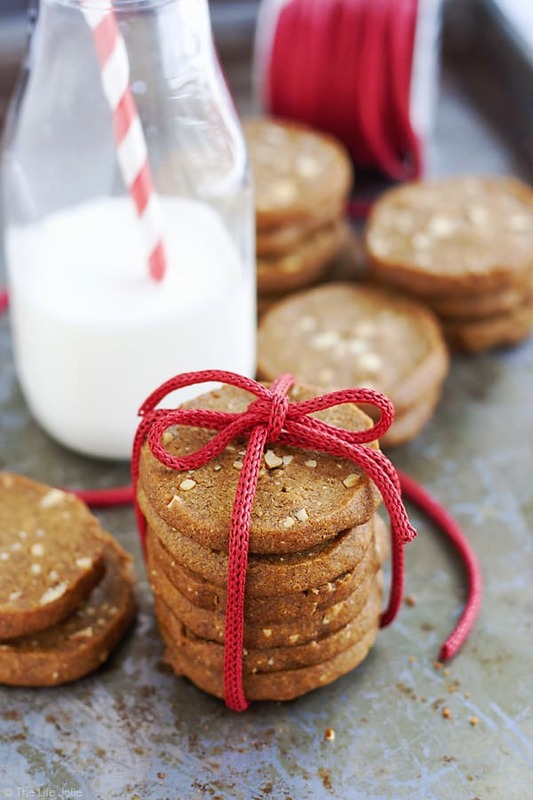 Although they’re similar, molasses cookies tend to be softer. 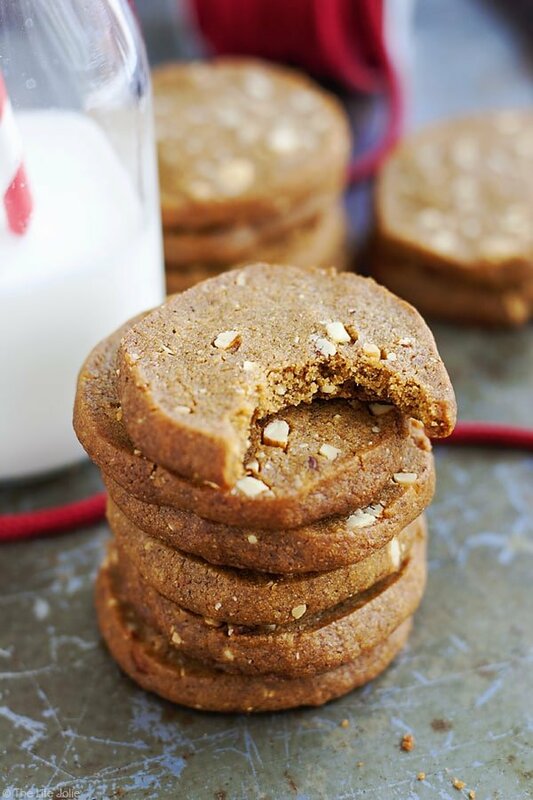 These are closer to a gingersnap. 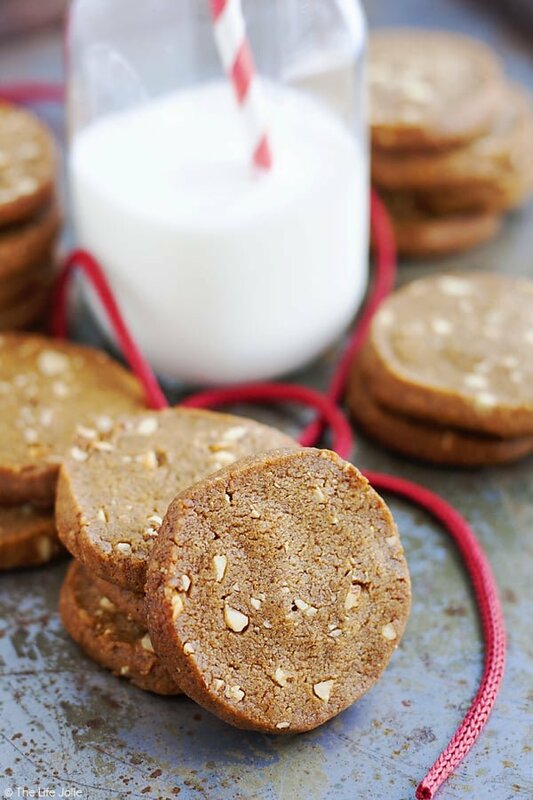 These Almond Ginger Cookies are such an easy dessert to make! 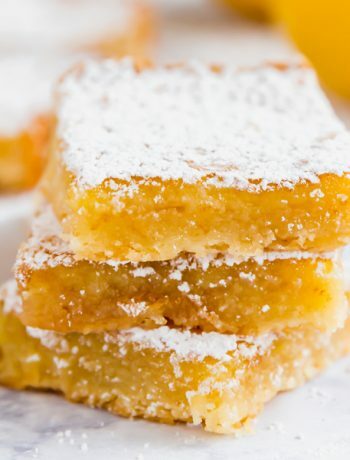 This crispy cookie is the best slice-and-bake option if you're looking for a spicy cookie that is that isn't overly sweet. They're great for Christmas! In a large bowl cream the butter, sugar and molasses until fluffy and well combined. 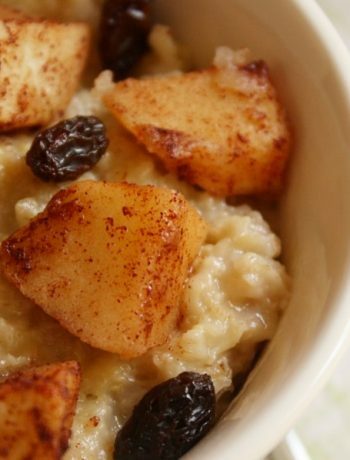 In a separate bowl, combine flour, baking soda, salt, ginger, cinnamon and cloves. Stir into the butter mixture. Mix in the almonds and shape into a couple of logs about 2 inches in diameter. Wrap in wax paper and refrigerate at least a couple of hours until they're firm and sliceable. Bake at 350 degrees on a greased pan (or lined pan) for 12-15 minutes. Mine were ready around 12 minutes. December 16, 2016 at 10:49 am I'm sorry to hear you are getting a late start to the holidays and hope hubby's back is feeling better. Your photos are beautiful, so crisp and clear. It makes me want to reach and grab a cookie. They look so delicious! December 19, 2016 at 12:19 pm Thank you you for you kind words! December 19, 2016 at 10:24 am I absolutely love this cookbook. I have many cooking memories that involve that book being out and part of the process! 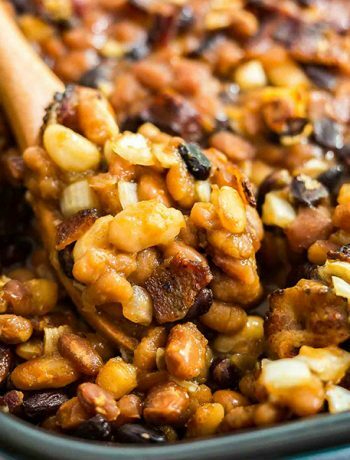 December 19, 2016 at 10:23 am Yum- almonds in anything are always a great idea! December 16, 2016 at 11:05 am These cookies sound amazing and I love how you presented them with the ribbon. So cute! December 19, 2016 at 10:23 am Thank you! I'll definitely be making them again! December 16, 2016 at 11:12 am My husband would love these cookies! Pinning to try. December 19, 2016 at 10:21 am Awesome- I hope you both enjoy them! December 21, 2017 at 11:57 am I can't find molasses anywhere!!!! Any suggestions for a substitute????? December 21, 2017 at 10:04 pm Hi Tania! You could sub corn syrup or maple syrup in place of it, just know the flavor will be different (not as strong). Dark brown sugar would probably give you the closest flavor but be aware that I haven't tested the recipe with these variations, so I cant make any guarantees. If you go the brown sugar route (in addition to the granulated sugar, not in place of) cream it in at the beginning as if it were the molasses. Please let me know which you go with and how they turn out- maybe it can help other readers who may not have that available near them as well. I love these cookies so much! Good luck and happy holidays!